The systems running on my desk, a shortwave radio and a laptop computer, are powered by backup batteries. Power service in this locale is subject to frequent long interruptions. We never know when the lights will blink off. So I always have a flashlight handy. Most of us have become so accustomed to routine use of those little sockets on the walls that we hardly think about it. But according to energy use projections, our demand for electrical power generation will double in the next ten years or so. It seems that very few places have realistic plans to build twice the infrastructure to stir up all those electrons. But we might all grown more accustomed to interruptions in service, if demand continues to grow and no new generating facilities are built. As far as I can determine, much of the Hollywood hype about the dangers of nuclear power generation is unfounded. Over the past thirty years Europe and Japan have forged ahead in nuclear technology while our power plants get shut down because nobody wants it in "in my backyard". resources. Perhaps the time has come to rethink. I've never been to Russia, but have visited several similar areas in the US. Rocky Flats is adjacent to the Denver suburban sprawl. The empty desolation sets the area apart, in sharp contrast to local shopping malls and housing. People who visit inside the restricted area wear protection suits and carry Geiger counters. The area of the Hanford nuclear reservation in Washington state used to be the property of a local indian tribe. Now it is off-limits for anyone sans appropriate isolation suit with breathing apparatus. The Hanford reservation contributed part of the enriched uranium for WW2 atomic bombs. Much of the chemical by-product was stored in above-ground tanks, which are now leaking. Groundwater runoff contaminates the Columbia River. The Oak Ridge facility in Tennessee was the counterpart for Hanford during WW2. When I visited there in 2000, there were many areas along the roadways that were bordered with bright yellow-painted chains, indicating that this area is off-limits due to contamination. Local folklore tells of one visitor who ran over a radioactive raccoon that was crossing the road. Their car was impounded and stashed away in some nuclear waste repository, contaminated for 5000 years. I have never visited Three-Mile Island, but understand that there isn't much that is remarkable there beyond the sealed concrete containment building. A couple of additional observations regarding nuclear technology. If things were at a standstill in the world since Chernobyl, I might have agreed that this was as good a place as any to put a stop to it. We can see the pros and cons of such technology, and in that light,might be inclined to reject further development in that area, via consensus and through well informed decisions. Unfortunately, others have already seen things differently, and since the late 70s, many other countries have pressed on in their pursuit of nuclear advancement. There is no way short of stone-age regression for us to put the nuclear genie back in the bottle. The various motives we ascribe to these development programs are irrelevant. The fact remains, nuclear technology will continue to develop. Given that premise, our continuing recalcitrance in nuclear development makes less and less sense. 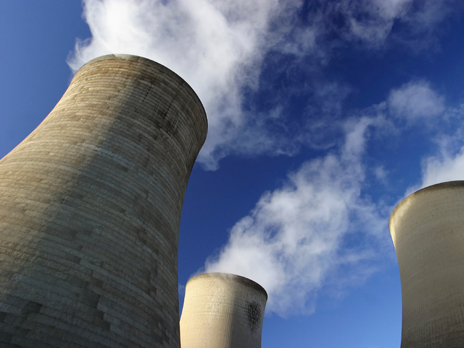 We could take the lead in researching beneficial applications for nuclear technology. We have discovered this potentially great power. Now we know something about the potential costs as well. What better perspective from which to continue to work the problems. Or we can do as we are, refuse to acknowledge the pressing need for advancement and development, sit back and wait for the lights to dim and go out. than 100 scientists has concluded. others who died as late as 2004. On the other hand, many European countries have successfully -- and apparently safely -- operated nuclear facilities since the late 60s. As have the Japanese and Canadians. Interesting that we can't use the technology developed here, but others can exploit it for their gain. Most of the rest of the world seeks some kind of nuclear power generation resources. The US is the only place where such unreasoning opposition to this particular technology prevails. Interesting discussion of this issue at PBS. Somewhat dated, but lots of information. Information from Canadian nuclear power consortium. They market nuclear technology to many other countries. What we do with by-products from nuclear operations now is stack them up some place for 500 years. This level of approach to such a technical problem is something akin to accumulating human waste products into a big stinking pile. It concentrates the problem into a smaller space, but does little to address the real issues. The US stopped trying to deal with nuclear waste in any other way more than 30 years ago. Since then, nuclear technology has not halted. Wastes are still being generated, by the ton, every day. It gets stacked away somewhere, which is simply deferring the problem, not dealing with it. We need intensive research programs to develop the technology to deal with nuclear waste. This should be an issue of technology, not politics. When we have human waste byproducts to deal with, we build treatment plants and recycling facilities along with our waste disposal sites. This is the area of focus needed for nuclear development. Not abandoning the problem because it smells bad or because it has an unsavory reputation. The biggest problem with NIMBY attitudes is that they are too localized and naive to see that all the world is "my back yard", and pushing problems further away from where we live only defers and complicates a better solution. We cannot expect to solve a problem using the same level of mentality that created it.